Samuel Benjamin Watkins IV (born June 14, 1993) is an American football wide receiver for the Kansas City Chiefs of the National Football League (NFL). He played college football at Clemson and was drafted by the Buffalo Bills fourth overall in the 2014 NFL Draft. He has also played for the Los Angeles Rams. Watkins attended South Fort Myers High School in Fort Myers, Florida, where he was a letterman in football, basketball and track & field. He became the all-time leading receiver in the history of Lee County with 133 catches for 2,997 yards and 36 touchdowns during his career. In his junior and senior years, he was a first-team all-state selection. As a sophomore, he had 33 receptions for 537 yards and 10 scores. In his junior year, he added 46 catches for 1,192 yards and 14 touchdowns. As a senior, Watkins had eight 100-yard receiving games on the season, accumulating totals of 54 catches for 1,268 yards and 12 touchdowns. He led an undefeated South Fort Myers team into the 3A state semifinals, where they lost 44–28 to a Duke Johnson-led Miami Norland team. He played in the 2011 U.S. Army All-American Bowl. In addition to football, Watkins ran track & field for the Wolfpack, where he was one of the state's top performers in the sprinting events. As a junior, he finished fifth in the 100 meters and sixth in the 200 meters at the state meet. As a senior, he captured the AA state title in the 200 meters, with a PR of 21.11 seconds. He also won the 100 meters at the 2011 Tarpon Invitational, recording a personal-best time of 10.45 seconds. Watkins was a highly touted recruit before the 2011 college football season. Regarded as a five-star recruit by Rivals.com, he was rated the third-best wide receiver prospect in the nation, behind only George Farmer and Trey Metoyer. He was ranked fifth best by Scout.com. Watkins committed to Clemson University in November 2010. Recruited by dozens of schools, he chose Clemson over offers from Florida, Florida State, Miami (FL), Michigan, and Tennessee. Despite not taking part in spring practice, Watkins made an immediate impact for Clemson in his freshman season in 2011. He caught 82 passes for 1219 yards and 12 touchdowns in his first collegial season, including 10 catches, 155 yards and two touchdowns against the defending national champion Auburn Tigers. He led the nation in reception yards per game, all-purpose yards and touchdowns. He also broke 11 school freshman records seven games into the season, including total all-purpose yards previously held by C. J. Spiller. He was an AP first-team All-American, becoming only the fourth ever true freshman to do so, joining Herschel Walker, Marshall Faulk and Adrian Peterson. He was also named a Freshman All-American by the Football Writers Association of America. As a sophomore in 2012, he had 57 receptions for 708 yards and three touchdowns. As a junior, he had 101 receptions for 1,464 yards and 12 touchdowns. He was the MVP of the 2014 Orange Bowl after setting an Orange Bowl record with 16 receptions for 227 yards against the Ohio State Buckeyes. He also set the school record for career receptions in the game finishing with 240. In January 2014, Watkins announced that he would forgo his senior season and enter the 2014 NFL Draft. The following table lists Watkins' college career statistics. Watkins was drafted by the Buffalo Bills in the first round as the fourth overall pick in the 2014 NFL Draft. Cleveland traded this selection to Buffalo in exchange for Buffalo's 2014 first round selection (the 9th pick, later traded by Cleveland to Minnesota, who used it to select UCLA linebacker Anthony Barr), and their first and fourth round selections in 2015 (19th Cameron Erving C & 115th Ibraheim Campbell S) He was the first wide receiver selected by the Bills in the first round since Lee Evans in 2004, and the earliest wide receiver selected in the draft since A. J. Green in 2011. 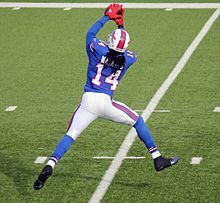 On May 28, 2014, Watkins signed his rookie contract, a fully guaranteed four-year deal worth $19.94 million, with a $12.8 million signing bonus. He caught his first career touchdown reception from EJ Manuel in a Week 2 29-10 victory over the Miami Dolphins. In Week 7 against the Minnesota Vikings, Watkins caught nine passes for 122 yards for two touchdowns. His second touchdown was the game winner coming with one second remaining in the game. Watkins finished his season setting a new Bills rookie record in both receptions (65) and receiving yards (982). In addition to his rookie records, Watkins caught six touchdown passes. Through the first five games of the 2015 season, Watkins (who played in only three of the games because of a calf injury) had just seven catches for 99 yards. He voiced his frustration before game 6, saying "You came up to draft me and I’m not getting targets — that’s a problem. You’re making me look bad and you’re making yourself look bad. Why not make both of us look good?" On October 27, 2015, frustrated with his social media followers for leaving angry comments about him missing three games due to injury, Watkins took to his Instagram and lashed out at critical fans. In a comment which Watkins later deleted, he told the fans to "get a life and go to work" and "continue working y'all little jobs for the rest of y'all lives". This caused an uproar with many Bills fans. Watkins followed up, with a clarification posted on Twitter stating, “Message wasn’t for fans (but) for whomever have a problem with athletes being injured.” Watkins later posted another Instagram photo addressing the situation, saying his comments were "inappropriate" and acknowledged that a majority of the negative comments were from other fans and not Bills fans. 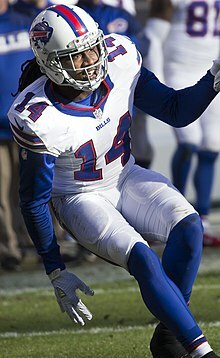 Playing on an injured ankle that had kept him out of a Friday practice, Watkins had a career-high 168 receiving yards on eight catches with one touchdown in a Week 9 33–17 victory over the Miami Dolphins. In his first seven games of the season, he caught only 25 passes for 314 yards and three touchdowns, while only having one 100-yard receiving game. In his final six games, however, he had 679 receiving yards on 35 catches (19.4 yards per catch), six touchdowns, and four 100-yard receiving games. He also had at least 80 yards receiving in all six games. With his late season push, Watkins finished the season with 60 catches for 1,047 yards and nine touchdowns receptions. He recorded five 100-yard receiving games and set his career-high in receiving yards and touchdowns. However, the Bills finished the season 8-8 and did not make the playoffs. He was ranked 96th by his fellow players on the NFL Top 100 Players of 2016. On May 16, 2016, it was reported that Watkins had broken a small bone in his foot. Watkins had a screw inserted in his foot, and the Buffalo Bills medical staff was hopeful that would be ready for training camp. On September 30, 2016, he was placed on injured reserve. He was activated off injured reserve on November 26, 2016 prior to Week 12. 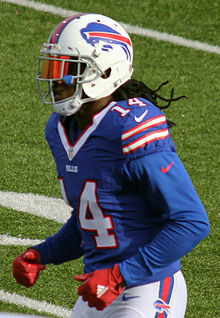 On May 2, 2017, the Buffalo Bills declined Watkins' fifth-year option, essentially making him a free agent after the 2017 season. On August 11, 2017, Watkins, along with a 2018 sixth-round draft pick, was traded from the Buffalo Bills to the Los Angeles Rams in exchange for E. J. Gaines and a 2018 second round draft pick. On September 10, 2017, in the season opener against the Indianapolis Colts, Watkins had five receptions for 58 yards in his Rams debut in the 46–9 victory. Watkins recorded his first touchdown of the season with 106 yards against the San Francisco 49ers in Week 3 with a stunning catch for the Rams 41–39 victory. In Week 9, Watkins caught a season-long 67-yard reception from Jared Goff that resulted in a touchdown as part of the 51–17 blowout win by the Rams over the New York Giants. Overall, he finished the 2017 season with 39 receptions for 593 receiving yards and eight receiving touchdowns. On March 15, 2018, Watkins signed a three-year, $48 million contract with the Kansas City Chiefs. In the 2018 season opener, he recorded three receptions for 21 yards in his Chiefs debut against the Los Angeles Chargers. He recorded six receptions for 100 yards in the following game against the Pittsburgh Steelers. In Week 8, against the Denver Broncos, he had eight receptions for 107 yards and two touchdowns. He finished the 2018 season with 40 receptions for 519 receiving yards and three receiving touchdowns. In the Divisional Round victory over the Indianapolis Colts, he had six receptions for 62 yards. in the AFC Championship overtime loss to the New England Patriots, he had four receptions for 114 yards. In a pre-draft interview, Watkins said that his favorite football team, as a child, was the Buffalo Bills. In May 2012, Watkins was arrested by Clemson campus police for possession of marijuana. He was also found to have one pill each of Vyvanse and Adderall and charged with possession of a controlled substance. As a result, Watkins was suspended for the first two games of the 2012−2013 season. Watkins completed pre-trial intervention and had the charge expunged from his record. His older half brother, Jaylen Watkins, is a defensive back for the Los Angeles Chargers. Both Sammy and Jaylen were selected in the 2014 NFL Draft, 97 picks apart. He has three daughters, Samiah, Saliah and Azaria from two different mothers. ^ "Fort Myers product Sammy Watkins agrees to reported $48 million deal with Kansas City Chiefs". The News-Press. Retrieved November 1, 2018. ^ "Uncharacteristic mistakes doom South Fort Myers in state semis". Naples News. December 10, 2010. ^ "Tarpon Invitational - Complete Results (Raw)". ^ Reynolds, Tim (February 2, 2011). "National Signing Day - ACC: Scott is 1st to send signed letter to Miami". The Brownsville Herald. Associated Press. Retrieved November 15, 2011. ^ "Sammy Watkins". Scout.com. Retrieved November 15, 2011. ^ Hayes, Chris (November 23, 2010). "South Fort Myers WR Sammy Watkins commits to Clemson". Orlando Sentinel. Retrieved November 15, 2011. ^ a b Hass, Bill (September 22, 2011). "Bill Hass on the ACC: True Freshman Sammy Watkins Gives Clemson a Burst". theACC.com. Archived from the original on October 10, 2012. Retrieved November 15, 2011. ^ "Sammy Watkins". ESPN.com. Retrieved November 15, 2011. ^ a b Dinich, Heather (October 19, 2011). "Clemson's Sammy Watkins plays above age". ESPN.com. Retrieved November 15, 2011. ^ Wine, Steven. "Clemson freshman receiver Sammy Watkins has West Virginia worried". The Associated Press. Salt Lake Tribuin. ^ "FWAA names 2011 Freshman All-America Team". FWAA. January 9, 2012. ^ Wood, Ryan. "Watkins has record-breaking performance in Orange Bowl". ^ "Fort Myers' Watkins named MVP as Clemson prevails". News-Press. ^ "Clemson's Sammy Watkins has record night in Orange Bowl". ^ "Clemson Tigers Receiving". College Football at Sports-Reference.com. Retrieved November 22, 2017. ^ "Clemson WR Watkins leaving early for draft". ESPN.com. ^ "Sammy Watkins College Stats - College Football at Sports-Reference.com". ^ "NFL Events: Combine Player Profiles - Sammy Watkins". www.nfl.com. ^ "2014 NFL Draft Listing". Pro-Football-Reference.com. Retrieved November 1, 2018. ^ Patra, Kevin. "Bills grab Sammy Watkins after trading up to No. 4". NFL.com. ^ "Buffalo Bills All-Time Draft History". Pro-Football-Reference.com. Retrieved November 1, 2018. ^ Patra, Kevin. "Sammy Watkins, Buffalo Bills strike rookie deal". NFL.com. ^ Crumpton, Tony (December 15, 2014). "Sammy Watkins sets Bills' rookie record". ^ "Sammy Watkins speaks up: 'When I have one-on-one coverage, go to me'". Buffalo Bills. October 15, 2015. ^ "Bills' Watkins to fans: 'Continue working y'all little jobs for the rest of y'all lives'". The Guardian. October 28, 2015. Retrieved November 1, 2018. ^ Schwartz, Nick (October 28, 2015). "Sammy Watkins lashes out at critical fans on Instagram". usatoday.com. Retrieved November 8, 2015. ^ Braziller, Zach (October 28, 2015). "Bills' Sammy Watkins blasts 'loser' fans doubting his health". nypost.com. Retrieved November 8, 2015. ^ Hanzus, Dan (November 8, 2015). "Sammy Watkins' career day turns around Bills' frustrating Sunday". espn.com. Retrieved November 8, 2015. ^ "'Top 100 Players of 2016': No. 96 Sammy Watkins". NFL.com. ^ Schwab, Frank (May 16, 2016). "Bills WR Sammy Watkins dealing with yet another injury". yahoo.com. Retrieved May 17, 2016. ^ Brown, Chris (September 30, 2016). "Bills place Watkins on I-R; sign WR Hunter". BuffaloBills.com. Retrieved September 30, 2016. ^ Brown, Chris (November 26, 2016). "Sammy Watkins added to active roster; Expected to play Sunday". BuffaloBills.com. ^ Patra, Kevin. "Bills decline to pick up Sammy Watkins' option". NFL.com. Retrieved May 2, 2017. ^ Sessler, Marc (August 11, 2017). "Bills trade Sammy Watkins to Rams, acquire Matthews". NFL.com. ^ "Indianapolis Colts at Los Angeles Rams - September 10th, 2017". Pro-Football-Reference.com. Retrieved October 7, 2017. ^ "Los Angeles Rams at San Francisco 49ers - September 21st, 2017". Pro-Football-Reference.com. Retrieved September 25, 2018. ^ "Los Angeles Rams at New York Giants - November 5th, 2017". Pro-Football-Reference.com. Retrieved September 25, 2018. ^ "Sammy Watkins 2017 Game Log". Pro-Football-Reference.com. Retrieved March 12, 2019. ^ Patra, Kevin (March 14, 2018). "Sammy Watkins' Chiefs deal has $21M signing bonus". NFL.com. ^ "Chiefs Sign Wide Receiver Sammy Watkins". Chiefs.com. March 15, 2018. ^ "Chiefs beat Chargers 38-28 in season opener". Arrowhead Pride. Retrieved November 1, 2018. ^ Pryor, Brooke. "With 100-yard game, Sammy Watkins is starting to catch on to Andy Reid's system". Kansas City. Retrieved November 1, 2018. ^ "Sammy Watkins' big afternoon spurs Chiefs to 30-23 victory against Denver Broncos". Kansas City. Retrieved November 1, 2018. ^ "Sammy Watkins 2018 Game Log". Pro-Football-Reference.com. Retrieved March 12, 2019. ^ "Divisional Round - Indianapolis Colts at Kansas City Chiefs - January 12th, 2019". Pro-Football-Reference.com. Retrieved March 12, 2019. ^ "AFC Championship - New England Patriots at Kansas City Chiefs - January 20th, 2019". Pro-Football-Reference.com. Retrieved March 12, 2019. ^ "Sammy Watkins". NFL.com. Retrieved April 1, 2019. ^ Brenner, Aaron. "Clemson WR Sammy Watkins will play for his favorite team as a boy: the Buffalo Bills". Post and Courier. ^ "All-American Sammy Watkins suspended two games for arrest". USA Today. ^ "Inside The Bills | Watkins embracing leadership role". Buffalo Bills. Retrieved May 25, 2016. Wikimedia Commons has media related to Sammy Watkins (American football).